I thought I would take this time to share with everyone my most favorite toy of all time. It's called "flappy". I got this as a gift as a wee little one from my uncle. Now at first I didn't know what to do with this toy, but as I got older the more I wanted to flap it in my mouth, toss it in the air and chew on it all day long. I love to bring it right to my dad's feet, and he just tosses it for me until I can't breath anymore. It makes me happy to play with it. It makes my heart dance when dad yells for me to "get your flappy", and I just know fun times are ahead. So if you can talk your parents into getting you one, I highly encourage it. After all a toy that rhymes with happy, just has to be good. 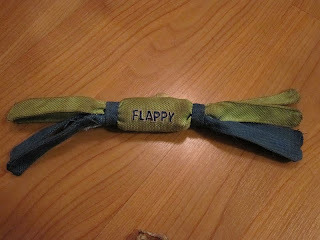 Ahhh...the Flappy! Very cool Bellatrix! I bet it's lots of fun to chase that one! I like to de-stuff my toys... My grandmahuman has to stitch some back together each week. Now that's fun! I can tell you reeeally like the flappy. The better the toy, the grosser it gets! I'm kinda with Spencer on the de-stuffing. None of our toys have as many arms/legs as they're supposed to. And I ALWAYS chew their eyes off right away. I have to say that I have never removed the stuffing. I really love my toys intact. I even still sleep with my infant toys, I would include a picture, but I usually have private moments and like to suckle on them. I have to say I am lucky I don't rip them apart mom and dad have no idea how to sew. Yikes!